When I was a kid I had a huge obsession with Atlantis. The whole idea of this sunken island was fascinating. I would watch those shows where they would dive and look for things. Atlantis Rising takes that story and gives it a unique twist. I like the idea of how the Island sunk and that the Atlantians (which are referred to Dewing) are just living among us. I really enjoyed the characters. I liked how even though Allison is the star of the show, you find yourself connected to Ian and Brandy. There were parts that really pulled at my heart strings that weren’t necessarily involving Allison. I also liked the strong adult influence of Spencer, Katherine and Lillian. They were not perfect but they were not evil and supportive for the most part. They seemed to accept Ian’s fate but they also explained how their brains worked a little differently than humans. At first Allison drove me a little batty because I didn’t understand how she thought what she was doing would make her disappear. I loved that Ian called her on it. I think she just has this extreme reaction to things for some reason but she is also fiercely loyal. I loved how much she cared about her adoptive family and would do anything to protect them. I loved the plot. The idea that there is this complete society overlapping is fascinating. Not only that but getting down to the differences between the Dewing and Humans and how they interact with other Emotionally, Socially and Physical in a way (I’m thinking likeness). I’m not sure if there are going to be more books but I felt like this could have spread out to even at least two books. I think it was difficult to cram all of this into just one book and therefore gave certain parts that kind of rushed feeling. I felt like this was a unique and interesting YA read. I think if your looking for a different mythology this would definitely be one to pick up. I wish it had been spread across two books to give it a little more flex room for things to develop but I figure the fact I want more is never a bad thing. I wouldn’t mind seeing more from this world. Hi Jen. Thanks for taking the time to review my book! 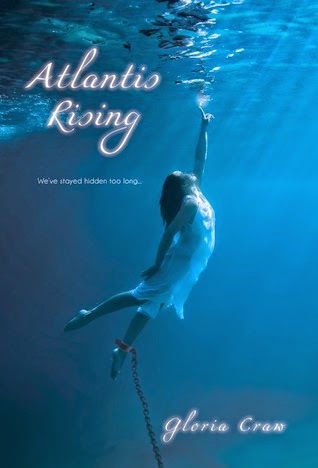 I thought I'd let you know, Atlantis Rising is actually the first in a three book series. The subsequent books didn't get mentioned at the back as was planned. Thanks again! This book caught my eye, so I was glad to see your review. I kind of love the idea of Atlantis too! Glad to know that the book was good!